Kris Jenner is "trying to remain calm" amidst her son Rob Kardashian's feud with his ex-fiacee Blac Chyna. The 30-year-old sock designer was faced with a restraining order earlier this week after he took to social media to post explicit photos of his former fiancé - with whom he has eight-month-old daughter Dream - who later accused him of being physically violent toward her. And although Rob's mother Kris, 61, is used to putting an end to the drama surrounding the famous family, she's reportedly focusing her energy on her granddaughter's "well-being". A source told Us Weekly magazine: "If this happened a year ago she'd freak out. She's trying to remain calm. She just wants to make sure Dream is OK. Now that Dream is in the picture, her primary concern is Dream and Dream's well-being." Rob - who starred alongside 29-year-old Chyna in their reality series 'Rob & Chyna' - was ordered by a judge on Monday to stay 100 yards away from his ex-fiancée, but has been allowed to continue co-parenting their daughter. And Chyna - who also has four-year-old son King Cairo with her former partner Tyga - recently claimed she had no intention of stopping the 'Keeping Up with the Kardashians' star from seeing his daughter, and hopes they can find "common ground" to successfully co-parent their tot. She said: "I would never try to take Dream from her dad. Hopefully, me and Rob can learn to have common ground and be the best co-parents as we can be." The news comes after Lisa Bloom, the lawyer for the 'Rob & Chyna' star, said despite the allegations of violence, the beauty doesn't believe her former flame poses a threat to their daughter, and is not worried about co-parenting with him. Lisa said: "Chyna is not concerned about Dream being around Rob. She has said he's a good father, there are nannies around when the baby is with him and she hasn't had any reason to be concerned. "We did not ask for the baby to be part of the restraining order... We just want him to stay away from her and to stop cyberbullying her." Kendall and Kylie Jenner insist a copyright infringement lawsuit relating to their controversial t-shirt range is "baseless". The 'Keeping Up with the Kardashians' stars recently came under fire for the $125 garments, which saw the sisters' faces printed over the top of portraits of music icons including Tupac, Notorious B.I.G.Jim Morrison and Ozzy Osbourne, and although the range has now been pulled, photographer Michael Miller is taking legal action against the sisters after accusing them of using the images without permission. However, the Kendall + Kylie brand have insisted the copyright infringement lawsuit is "baseless" because they obtained the shirts with the rapper's image - which then had their own likenesses superimposed over the top - from a company that had a valid license to sell them, and admitted they only sold two of the garments before pulling the stock from sale. The company said in a statement: "The allegations made are completely false and the lawsuit is baseless. "There has been no infringement or violation of anyone's rights." The news comes after Kendall, 21, and Kylie, 19, were threatened with legal action by the estate of Notorious B.I.G., who threatened to sue the pair if the $125 t-shirts were not removed from sale. Following the controversy, the brunette beauties posted an apology on their social media accounts, in which they admitted the designs were "not well thought out". They said: "These designs were not well thought out and we deeply apologise to anyone that has been upset and/or offended, especially to the families of the artists. "We are huge fans of their music and it was not our intention to disrespect these cultural icons in any way. "The tee shirts have been pulled from retail and all images have been removed. We will use this as an opportunity to learn from these mistakes and again, we are very sorry." And after reading the apology, the estate for the 'Juicy' rapper released a statement claiming the issue was "yet to be resolved". The statement read: "While we appreciate that the Jenners have made an apology and pulled the unlawful and unauthorised items, this matter has yet to be resolved." 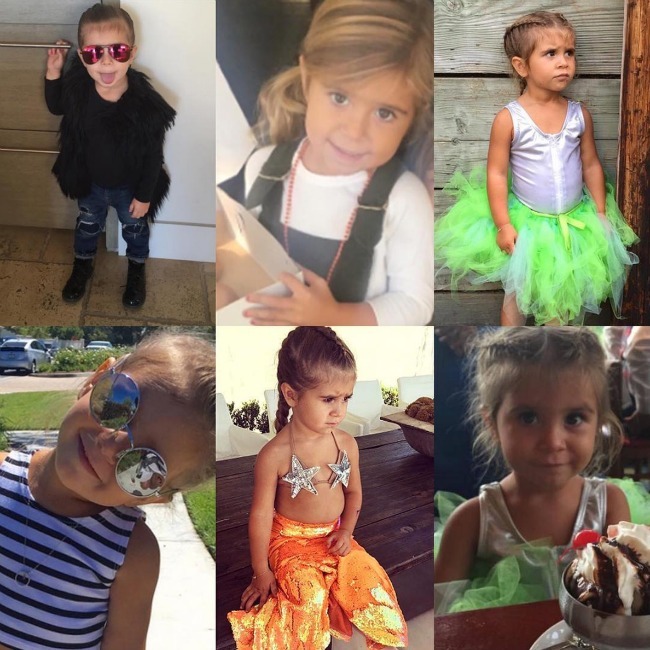 Penelope Disick has been showered with tributes from her famous family as she turned five on Saturday. The daughter of 'Keeping Up with the Kardashians' stars Kourtney Kardashian and Scott Disick celebrated her milestone birthday on Saturday, and her famous family were on hand to post sweet tributes to the tot across their social media accounts. Kourtney - who also has sons Mason, seven, and Reign, two, with her former partner - posted a video of Penelope opening her presents on Snapchat. The 38-year-old star captioned the footage: "My little angel is 5!" Whilst Scott, 34, posted a photo on his Facebook account on Friday of himself holding his daughter. Penelope's grandmother Kris Jenner took to Instagram to share a collage of pictures of the tot in various fancy dress costumes. She wrote: "Happy birthday to our sweet princess, our little mermaid Penelope!! We love you so much, precious angel!! #HappyBirthdayPenelope #Angel#sweetgirl #family (sic)"
Kim Kardashian West also took to the photo sharing app to post a sweet picture of Penelope alongside her own daughter North - whom she has with her husband Kanye West - as she thanked the young girl for being her child's "best friend". She captioned the snap: "Happy Birthday my sweet P! Thank you for being the best friend to my North! I love you! (sic)"
For her birthday, Penelope received toys from NUM NOMS and pomeranian teacup puppy which matched one given to North, who turned four last month. 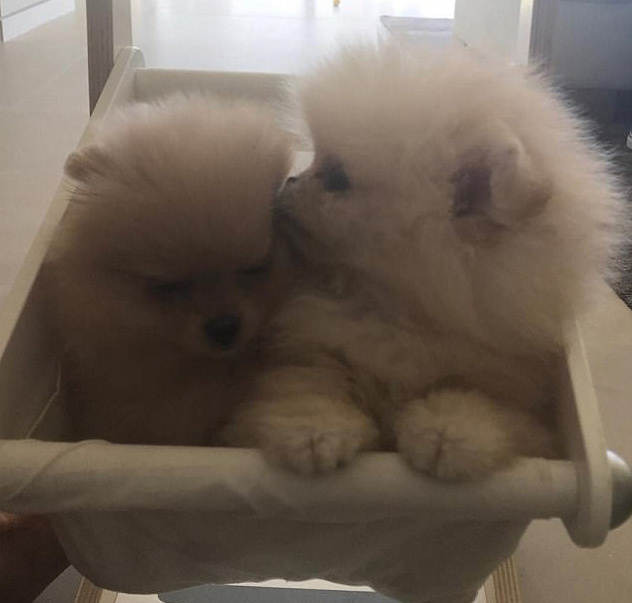 Kim shared a photo of the pooches on her Instagram last month and wrote: "Sister puppies for North & P! Penelope named hers honey. What should we name ours? (sic)"
Meanwhile, last weekend, Penelope and North were treated to a joint birthday party based around Disney movie 'Moana', which was attended by family friends including Jaden Smith. Khloe Kardashian hosted an amazing gold-themed Fourth of July bash to celebrate American Independence Day. The 'Keeping Up With The Kardashians' star got all her family and friends together to celebrate American Independence Day and her sisters showed off the amazing bash on their Snapchats. In one video, Khloe stood next to her mother Kris Jenner in front of a blow up slide, where they wished everyone a "Happy Fourth of July". 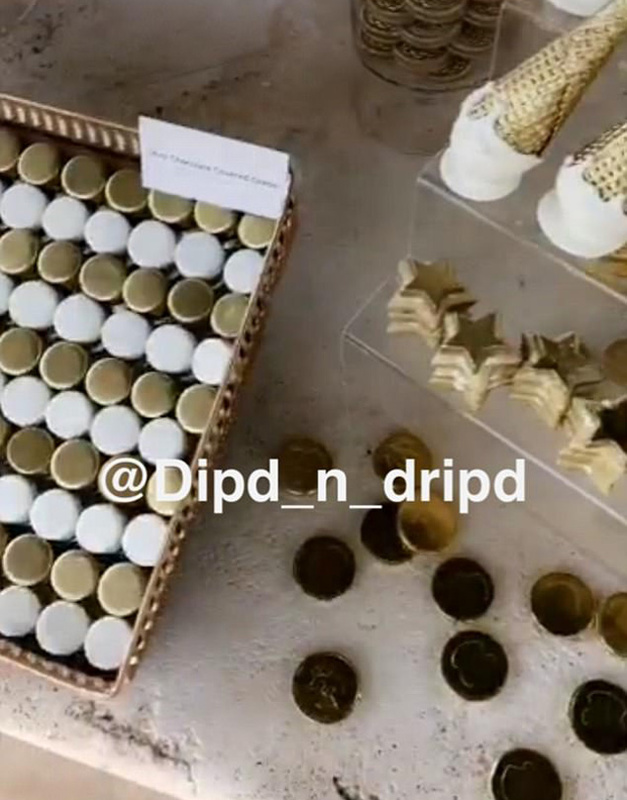 The 33-year-old television personality even splurged on gold dipped desserts from Los Angeles based Dip'd N Drip'd. Sharing a picture of the chocolate covered Oreos placed in the shape of the American flag, the company wrote: "Mini Chocolate Covered Oreos ...Hope everyone had an amazing 4th of July!! I had the pleasure and honor of making the sweets for the sweet @khloekardashian yesterday!! A true dream come true! 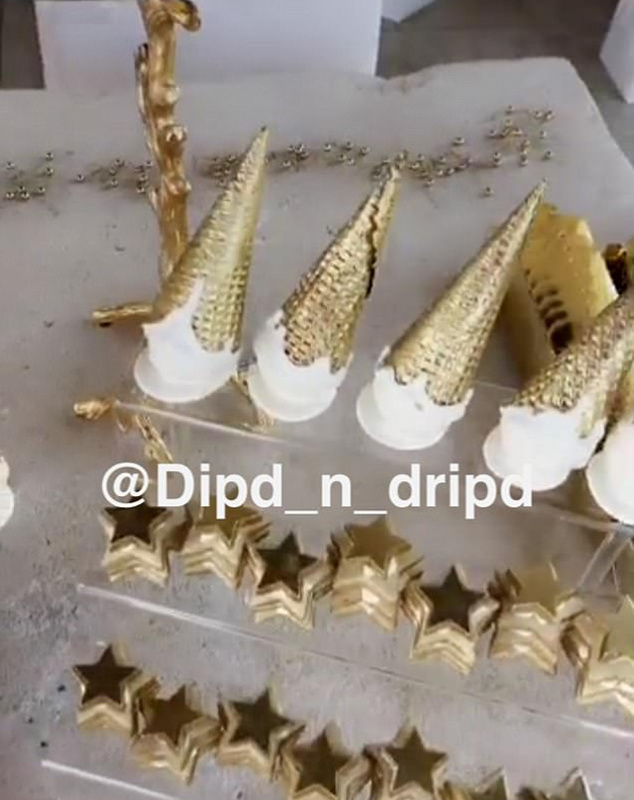 #fourthofjuly #party (sic)"
And in a second picture, they showed off all the gold-dipped treats including star-shaped desserts, ice cream cones and gold coins. Khloe's boyfriend Tristan Thompson was also in attendance at the pool party and the pair's relationship is going from strength to strength. The couple have even talked about having children, with Khloe recently admitting: "Tristan and I definitely talk about starting a family. He wants to have five or six kids with me and that's lovely. We could start at one and we could grow from there. But now knowing I'm not on birth control is just like - it's scary. It's like a really big step." And previously, Khloe revealed she would accept Tristan's proposal if he got down on one knee. She said: "Yes I would [accept his proposal] ... I have never been in this type of love ... I would love to have a family. We've talked about it. He [already] is a father, and I know for a fact that he would be an impeccable father. I definitely want to be a mom. But I don't put the pressure on it. It's not like, the clock is ticking. I feel in my soul it will happen." 'Keeping Up With the Kardashians' star Kylie Jenner has teamed up with athletics brand Puma for their new Velvet Rope range of sportswear. The 19-year-old 'Keeping Up With the Kardashians' star has stunned fans in a series of photos showing off her toned body, as she joined forces with the athletic brand for their latest range - entitled Velvet Rope - which launched on Monday. The Velvet Rope collection - which forms Puma's Autum/Winter 2017 line - includes shades of olive, copper, silver and navy, and the items in the range are designed to flatter the figure with a mix of velvet and lycra. The range also includes lace free-trainers. Puma took to Instagram to show off the professional snaps of the lip kit mogul, writing: "Slay doubts. Live #Fierce with @kyliejenner. Velvet Rope drops today. (sic)"
Kylie's hours in the gym were put on display as she was photographed grasping hold of a rope climbing wall while wearing items from the new collection. In another photo, Kylie donned a baggy pair of black jogging bottoms along with a matching top, showing that sportswear can be stylish too. For Kylie, the new campaign comes as she also recently launched her first ever sunglasses line for Quay Australia. Speaking at the launch, she said: "I've been wearing Quay Australia sunglasses for a long time. I'm so excited to create my very own collection and share my love for the brand with my fans." For the brand launch, the fashion mogul and model stripped down flaunting her hourglass shape while donning a pair of the sunglasses. Quay Australia founder Linda Hammond said: "We've found the perfect collaborator in Kylie. Her social influence is unparalleled and she is known for her dynamic style and edge that her followers want to emulate." It's not all good news for Kylie though, as she and her 21-year-old sister Kendall made a fashion blunder when they were recently forced to withdraw controversial t-shirts from sale after they came under fire. The $125 garments saw the sisters' faces printed over the top of portraits of music icons including the late Notorious B.I.G., Tupac Shakur, Jim Morrison and Ozzy Osbourne, and they have admitted the designs were "not well thought out". Kim Kardashian West reportedly never "seriously" considered her sister Khloé Kardashian about being her surrogate but have found the "perfect surrogate" outside the family. The 'Keeping Up With The Kardashians' star has never considered seriously asking her sibling to carry her third child but Kim and her husband Kanye have found the "perfect surrogate" outside the family. A source told People magazine: "Kim and Khloé visiting the doctor and talking about surrogacy was more of a story line. There were never serious talks about Khloé being the surrogate. "They have found the perfect surrogate ... If things work out with the surrogate, they will be thrilled. But they still have a long road to go." Meanwhile, Kanye is reportedly keen to have "five or six" children with the 36-year-old reality star, despite Kim being warned by doctors against falling pregnant again after giving birth to the couple's two children, four-year-old daughter North, and 18-month-old son Saint. A source shared: "He would want a family of five or six if it was up to him. After having Saint, Kim was told she couldn't carry another baby - that it would be too dangerous. And she was okay with that." Whilst another insider added: "Kim was never going to let herself get pregnant again. It's just too dangerous for her. Kanye was initially the one pushing for baby No. 3. They are both very excited to give their kids a sibling. Things are great between them. They act very happy together." Kim's mother, Kris Jenner, and older sister Kourtney Kardashian previously offered to act as surrogates for the brunette beauty. In scenes aired on 'Keeping With the Kardashians' recently, Kris explained how her own doctor has told her she no longer has viable eggs, but that doesn't mean she can't carry a baby. Kim then asked: "Do you want to carry mine?" Kris replied: "If I really thought that I could carry it for you and it would be born OK, I would do it in two seconds. I really would." And Kourtney also volunteered, telling Kris: "I already offered myself. So, don't act like you're the only Mother Theresa in here!" Kim Kardashian West's closet friends are excited by the prospect she may have another child. The 'Keeping Up With the Kardashians' star and her husband Kanye West - who already have daughter North, four, and son Saint, 18 months, together - have reportedly hired a surrogate via an agency because the brunette beauty has been warned by doctors not to get pregnant again, and her pal Malika Haqq thinks it is "pretty awesome" they are going down a different route to expand their family. Malika told Closer magazine: "I want them to have a third baby as much as they want one. "We're all so excited for them. Challenges arise in so many different areas in life and the beauty in already being a parent and still wanting more children is pretty awesome. "I don't know if they want a boy or a girl, but I'm pretty sure they'll just be happy with a healthy baby." Details of Kim and Kanye's surrogacy deal were recently revealed. It is believed the couple are willing to pay the unnamed woman $45,000 in 10 equal instalments, though if it is a multiple pregnancy she will receive an additional $5,000 per child. The agreement also states the famous couple "assume the legal and parental responsibilities for any child ... that may possess any congenital or other abnormalities or defects." Kendall and Kylie Jenner have "deeply apologised" for their controversial t-shirts and withdrawn them from sale following a backlash. The 'Keeping Up With the Kardashians' stars came under fire for the $125 garments, which saw the sisters' faces printed over the top of portraits of music icons including the late Notorious B.I.G., Tupac Shakur, Jim Morrison and Ozzy Osbourne, and they have admitted the designs were "not well thought out". Kendall and Kylie both posted an apology on their Twitter pages, which read: "These designs were not well thought out and we deeply apologise to anyone that has been upset and/or offended, especially to the families of the artists. The decision to withdraw the garments from sale came after Notorious B.I.G. 's mother, Voletta Wallace, slammed the sisters as "disgusting" and accused them of "disrespecting" her and the family of the late rapper, whose real name was Christopher Wallace. She wrote on Instagram alongside a picture of the shirt with an X over it: "I am not sure who told @kyliejenner and @kendalljenner that they had the right to do this. "The disrespect of these girls to not even reach out to me or anyone connected to the estate baffles me. I have no idea why they feel they can exploit the deaths of 2pac and my Son Christopher to sell a t-shirt. This is disrespectful, disgusting, and exploitation at its worst!!!" (sic)"
Ozzy's wife, Sharon Osbourne, also hit out at Kendall, 21, and 19-year-old Kylie. She tweeted: "Girls, you haven't earned the right to put your face with musical icons. Stick to what you know.lip gloss." Kim Kardashian West has revealed her daughter's new puppy is called Sushi, after a long deliberation over which moniker to choose. The 36-year-old television personality recently gifted her four-year-old daughter North - whom she has with her husband Kanye West - a Pomeranian teacup puppy, and after a long deliberation over what moniker to bestow on the pet, the family have finally settled on Sushi. Kim confirmed the news on Twitter on Tuesday as she wrote: "FYI the puppy's name is Sushi (sic)"
The news comes after the 'Keeping Up with the Kardashians' star - who also has 18-month-old son Saint with her spouse - took to the micro blogging site on Monday to hold a poll for her followers to decide what to name the mutt. 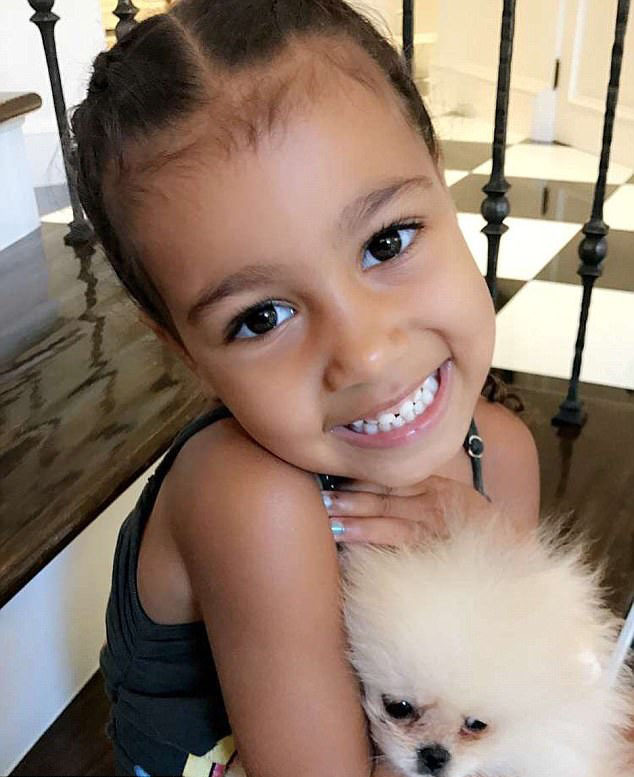 She wrote: "So still no name for North's puppy. This is what she came up with so far... Peachy Pop (peaches for short), Baby Jesus, Cutie Pie, & Goldie. "Please help us pick the final name! "Wait the other name on her list is Sushi! I forgot that one. I will make a poll (sic)"
And although Peachy Pop eventually won the vote by just four percent, second place moniker Sushi was chosen as the favourite by the family. North's puppy was bought for her as a set of two, with Kim's sister Kourtney Kardashian gifting the other pooch to her four-year-old daughter Penelope. Penelope didn't have the same trouble naming her pet though, as she settled on Honey almost immediately. Posting a picture of the pups on Instagram recently, Kim revealed: "Sister puppies for North & P! Penelope named hers honey. What should we name ours? (sic)"
Kim also took a video with North's puppy kissing her neck, and asked: "You guys how cute is North's little puppy? What shall we name you?"